It’s zucchini season! I picked up my CSA last week and viola, lots of zucchini and squash. In my opinion, there’s only so many things you can do with zucchini before you start getting sick of it… so I’m making it a personal mission of mine to try out some new recipes this season. 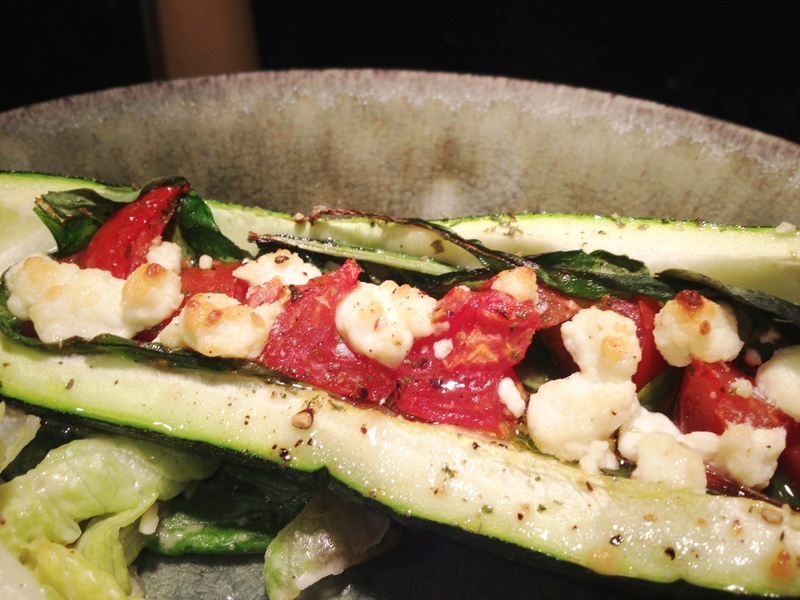 This week, I decided to try my hand at zucchini “boats”. I was grilling chicken and planned to serve it with a Caesar salad… but wanted another vegetable side to go with it. My veggie drawer is chock full of stuff right now, due to the abundance of our local farm’s crops… so I NEEDED to cook some. 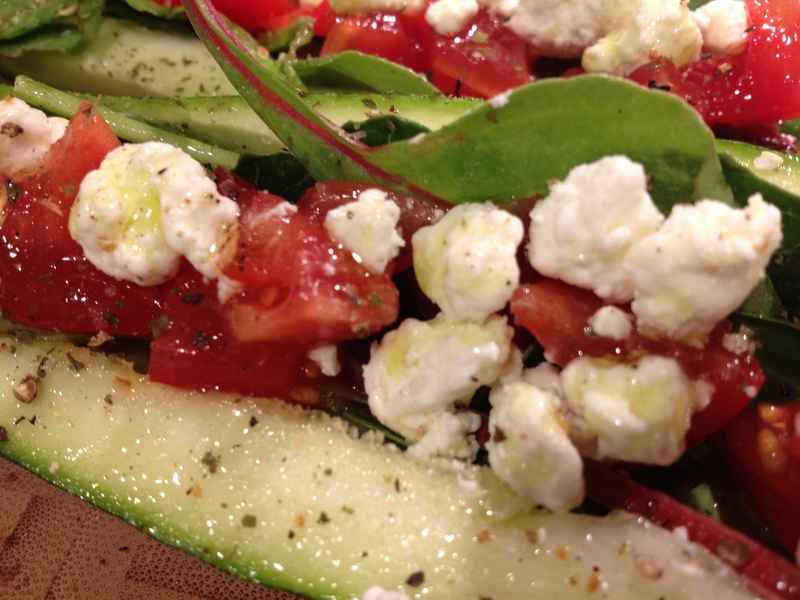 This recipe quickly came to fruition…. Wash, trim the ends and then cut the zucchini in half length-wise. 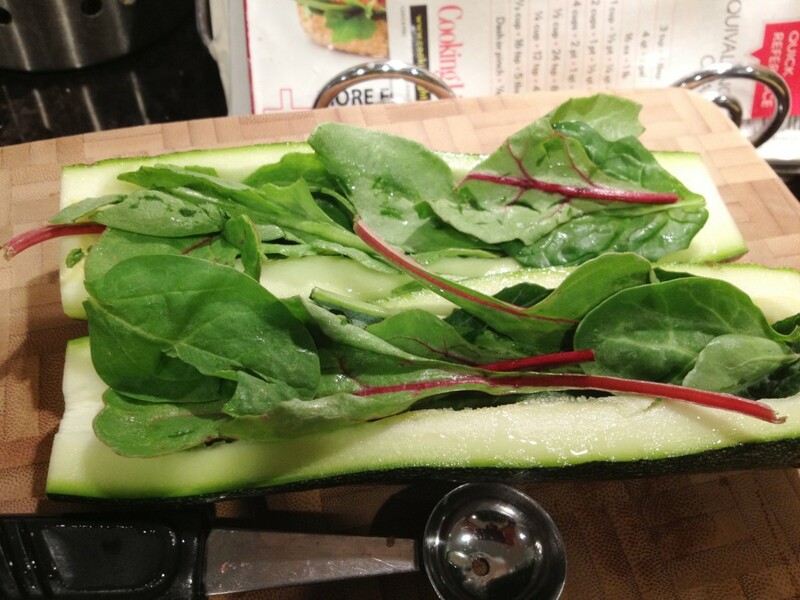 Using a melon baller, hollow out a cavity along the length of each half of the zucchini. Season each half with a little fresh ground sea salt. Gently press half of the baby greens into each half. I removed some of the thicker stems after I took this photo. 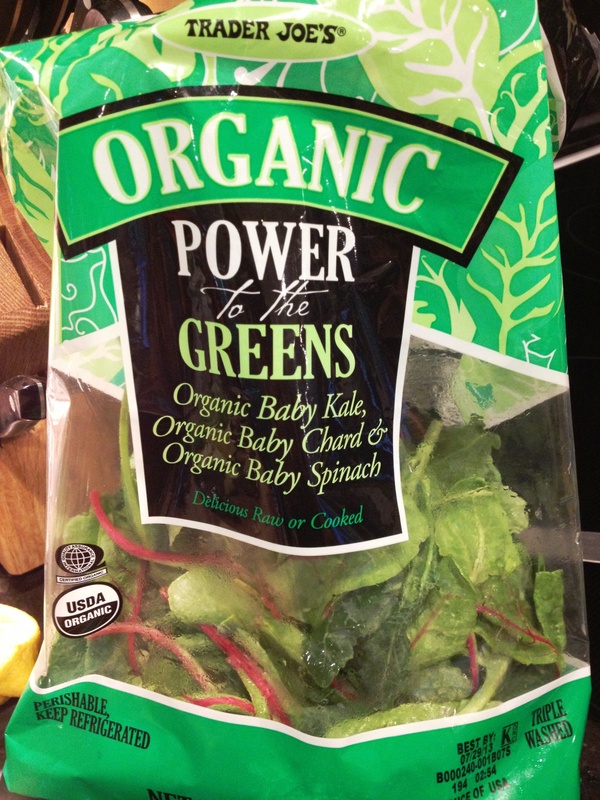 Trader Joe’s sells these awesome, organic “Power to the Greens”… which are a mix of baby kale, baby chard and baby spinach. You could easily use one or a combination of any of these greens or others you have on hand. Next, place the chopped tomatoes evenly on each half. Generously grind some fresh garlic salt to taste. This Trader Joe’s version has some dried herbs in it too. 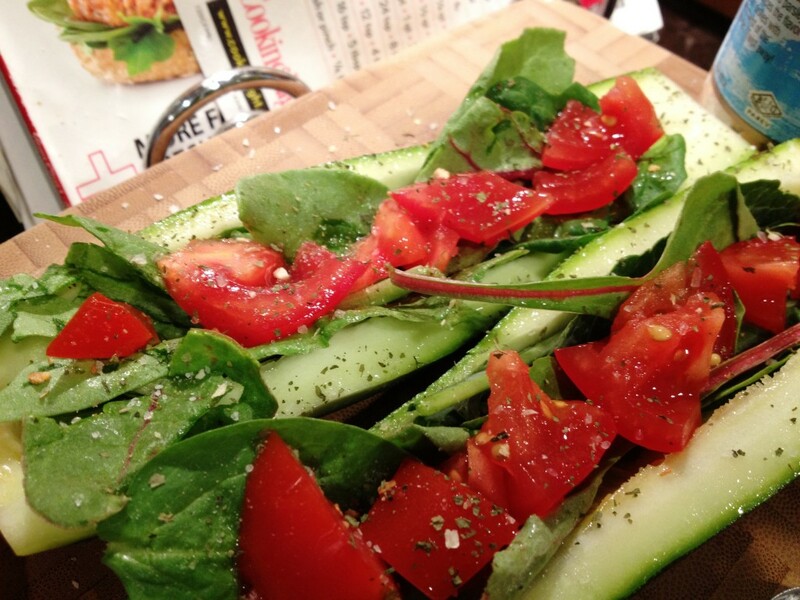 You can really season these anyway you like… using whatever seasoning you prefer. 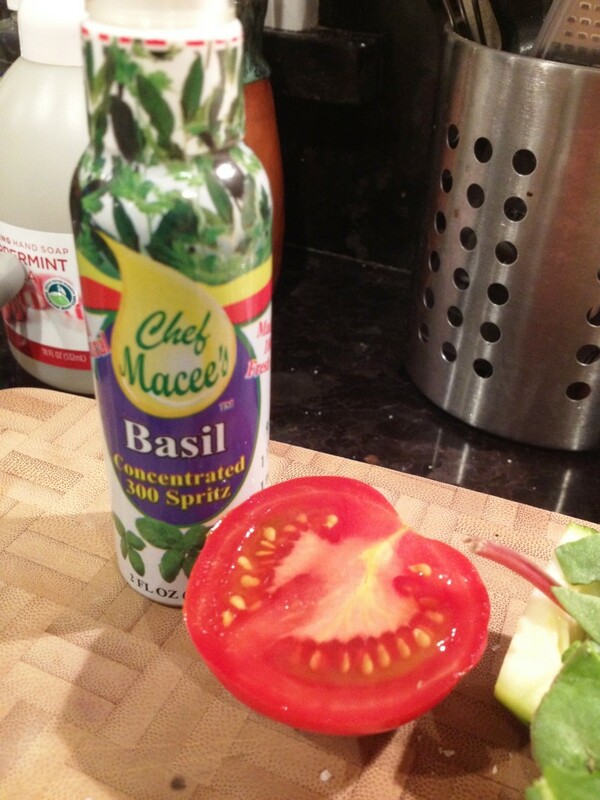 Spritz each half with a fair amount of basil olive oil concentrate. I can’t remember where I found this, but I’m pretty sure it was just at a local grocery store. You can also buy something like it here. If you can’t find it, don’t like basil or don’t have basil olive oil, you could easily just drizzle regular olive oil on each boat. Gently place about 1 tbsp of crumbled goat cheese (this is probably a little more) on each boat as well. Season to your liking with salt and pepper. Look how yummy this looks! I can’t wait until local heirloom tomatoes come in!!! Place the boats on a baking sheet an bake at 350 for 15-20 minutes. I did mine in a toaster oven… which I use to bake MOST of my smaller dishes. I flipped it to broil for the last few minutes to brown up the goat cheese. 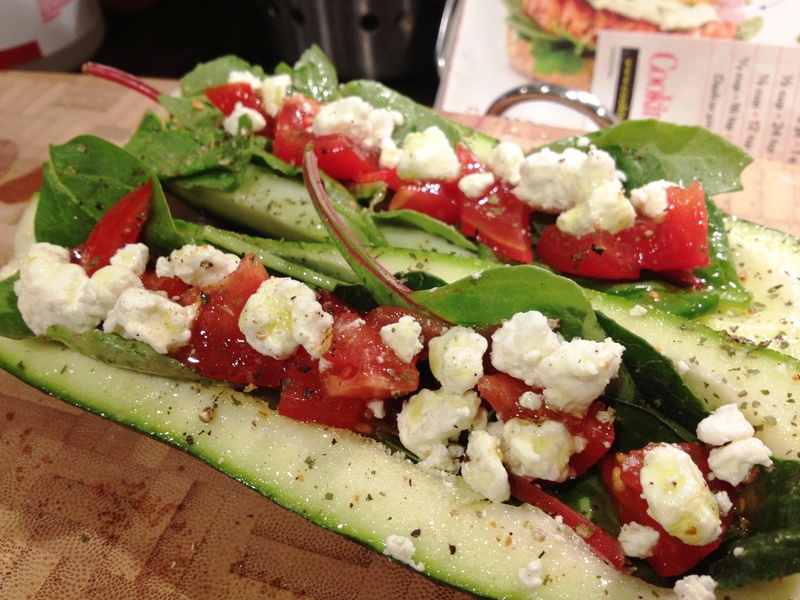 When done, the zucchini should be tender, the greens and tomatoes should be wilted and the goat cheese should be starting to melt and be browned.